Hank Moore is a Futurist and Corporate Strategist�, with his trademarked concept, The Business Tree�. Hank conducts independent performance reviews, Strategic Planning, Visioning and growth strategies for organizations of all sizes. He conducts Executive Think Tanks nationally...with the result being the companies' destinies being charted. His client list includes more than 5,000...including 100 of the Fortune 500 companies and many public sector entities. He advises at the Executive Committee and board levels, providing Big Picture ideas. As the world's only Corporate Strategist�, he works with boards of directors, CEOs and executive teams of corporations...guiding them toward a profitable Vision and increased shareholder value. He facilitates decision-maker "think tanks" based purely upon his own ideas and creative concepts. He is that rare 1 out of 100,000 senior business advisors, a Big Picture strategist, with original, cutting-edge ideas for creating, implementing and sustaining corporate growth throughout every sector of the organization. His Business Tree� is a trademarked approach to growing, strengthening and evolving business, while mastering change. 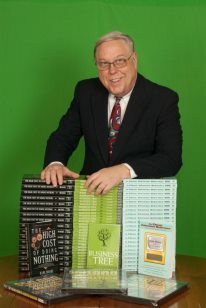 Hank Moore has published more than 200 articles and monographs in business publications, journals and consumer magazines and has written five books: The Business Tree�, The High Cost of Doing Nothing�, Power Stars to Light the Flame The Classic TV Reference and The Future Has moved and Left No Forwarding Address . Four more books are in production: Secrets of the CEOs, Pop Culture Wisdom, Confluence� and The Book of Words. Mr. Moore is the nation's premiere expert on Big Picture issues...and how core business specialists may enlarge their scope and assume mantles of greater responsibility and recognition. Hank Moore is one of the few keynote speakers who has covered Corporate Responsibility for many years. He is well acquainted with business crises and puts all into Big Picture perspective as a tool for moving companies successfully forward. In addition to keynote speaking, Mr. Moore has overseen 400 strategic plans and corporate visioning processes. He has conducted 200 performance reviews of organizations. He is a mentor to senior management. This scope of wisdom is most often utilized by CEOs and board members. The concept of inspiring industry members to become visionaries makes for a refreshing, informative and motivating keynote. Mr. Moore has a high-content, medium-delivery that lends itself to economic development, business trends and elected official modules and the consistency of a full-scope Think Tank. He presents high-profile keynotes about the current economic crisis. He has studied deregulation for 30 years and presents case studies of how it has hurt every industry that it has effected. Long an expert on ethics, he is being booked again to address the lessons that business should learn from the current corporate scandals. For the past three years, Hank Moore has been predicting two more cycles of corporate scandals because business would not learn the lessons of Enron. He wrote the first dossier on Enron for the U.S. Congress in December, 2001, having predicted Enron's downfall as far back as 1990. He has changed corporate cultures, reorganized corporations, charted new directions for associations, created new opportunities and strategically planned thousands of businesses. Most speakers motivate but have never run nor guided corporate strategies. Most clients don't know how to find a true Business Visionary. Hank Moore is the kind of speaker that you need to suggest. He has a deep, rich platform. He is the real deal who has advised businesses toward profound and successful innovations over four decades. He has more than 4,000 case studies of direct involvement with corporate companies. The Business Tree is his own creation, stemming from 40 years of working with businesses in struggle or transition. This is a back to basics approach. It looks at the whole of business, then the pieces as they relate to the whole, then at the whole again. Has spoken worldwide: Brazil, Kuwait, Dubai, England, Mexico, Canada, Japan, Netherlands, throughout the United States. Available for Keynote, Half-day programs, Full-day programs, Corporate counseling engagements. Background Industries: All major industries over 40-year career. Hank Moore is a refreshingly different HIGH-CONTENT speaker. His business savvy, track record, body of knowledge, case studies and handout materials provide a more comprehensive package than any other business presenter. He stays abreast of trends in most industries, providing insights and handouts that go beyond industry experts. He is that credible "second opinion" who has actually shaped business strategies for thousands of companies. Peter Drucker called Moore's Business Tree� the most original business model of the last 40 years. His business savvy, track record, body of knowledge, case studies and handout materials provide a more comprehensive package than any other business presenter. 1. Understanding how and why The Business Tree� (any organization) stands and grows...instead of looking at each leaf, twig or branch. 2. Inspiring executives to think holistically about the business in terms of the Big Picture, master change and take companies to new tiers. 4. Strategies to reduce The High Cost of Doing Nothing� ...making business more creative, effective and profitable. 1. The Business Tree�. 7 parts-progressions of a successful organization. 2. The High Cost of Doing Nothing....Why Good Companies Go Bad. 4. The Future Has Moved...and Left No Forwarding Address. 5. Power Stars to Light the Business Flame...The Business Visionaries and You. * Conference opening Futurism keynote. * Ethics and Corporate Responsibility speeches. * Non-profit and public sector planning retreats. * Diversity and sexual harassment (for top management). "Any serious organization would do well to listen to this man. He sparks of genius, creativity and plain common sense." "Hank Moore speaks from the brain and from the heart. I've personally observed his futuristic projections and insights since 1958." "Hank Moore really works miracles in changing stuck mindsets. He empowers knowledge from without by enthusing executives to reach within." Dino Nicandros, Conoco Inc.
"Hank Moore is a million dollar idea person. He is one of the few business experts whose work directly impacts a company's book value." Find out more about Hank Moore, Corporate Strategist™ at http://www.hankmoore.com.